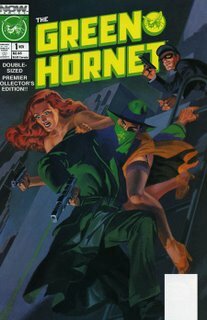 Bought this Green Hornet purely for the redhead cover. Females in fandom: Comic Book Noise had a podcast on Females in fandom, and after discussing big sites like Friends of Lulu, Sequential Tart-- he talks about some of the "larger" blogs he goes to...including this one. Nice words for Shelly- says her good taste is due to being a librarian! Coverage from the MidJersey Comicon from my VE friends (now producing a show at the Harvey Awards- rock on!). I'm so glad they gave some air time to indie creators that were at my show, and guests Mike Oeming and Chuck Satterlee. You can even see a punchy me at the end of the show! Giant Size Episode 25 and Luis' Video Blog from the MidJersey Comicon. Mike and Kevin take the new intern, Luis, to the MidJersey Comicon...hilarity ensues! Mike and Kevin talk to Chuck Satterlee, Scott Derby, Dave Perillo, Geekboy Press' Louie La Palombara and con organizer [me]. And Luis shows how not to react during an interview when he gets a shot to interview Mike Oeming and Rob Reilly. Good call on Green Hornet # 1 - it's actually done by Jim Steranko, and I actually have a full size poster version of that cover somewhere. Can't believe I didn't even look who did the cover art! Steranko, of course! My friend R said he also has the poster version, where her gun is a revolver instead of the revolver.